I believe I gave this address in Ft. Madison at Fiesta celebration Mexican Independence. Mexican Independence Honored guests, friends and all of you present, it is a great privilege and an honor to participate in this observance of Mexico’s Independence from Spain in the year 1810. As Mexican Americans our pride in our Mexican heritage is renewed and strengthened on this occasion. We are reminded that it was the driving force of the spirit of independence that inspired Cura Miguel Hidalgo and his followers to break the ruing chain of Spain and to forge out a new Mexican republic. It was this spirit of independence which strengthened the resolve of Benito Juarez and the Mexican people to expel the French invaders from Mexican territory in 1867. This same desire for freedom fired the zeal of the Mexican people to raise up in rebellion against 40 years of oppression under the dictatorship of Parfirio Diaz. This spirit of independence was personified by Jose Morelos, Maximiliano Zapata, Pancho Villa and many others. 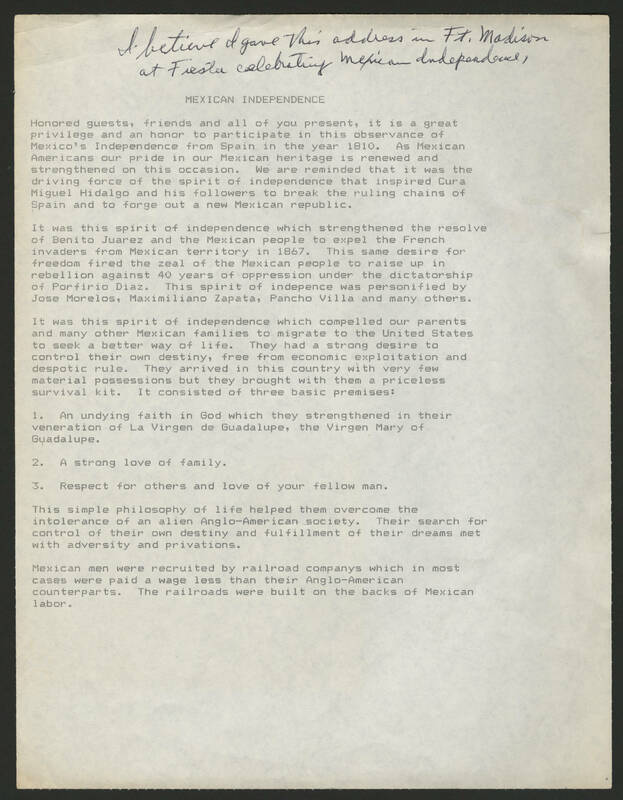 It was this spirit of independence which compelled our parents and many other Mexican families to migrate to the United States to seek a better way of life. They had a strong desire to control their own destiny, free from economic exploitation and despotic rule. They arrived in this country with very few material possessions but they brought with them a priceless survival kit. It consisted of three basic premises: 1. An undying faith in God which they strengthened in their veneration of La Virgen de Guadalupe, the Virgin Mary of Guadalupe. 2. A strong love of family. 3. Respect for others and love of your fellow man. This simple philosophy of life helped them overcome the intolerance of an alien Anglo-American society. Their search for control of their own destiny and fulfillment of their dreams met with adversity and privations. Mexican men were recruited by railroad companys which in most cases were paid a wage less than their Anglo-American counterparts. The railroads were built on the backs of Mexican labor.